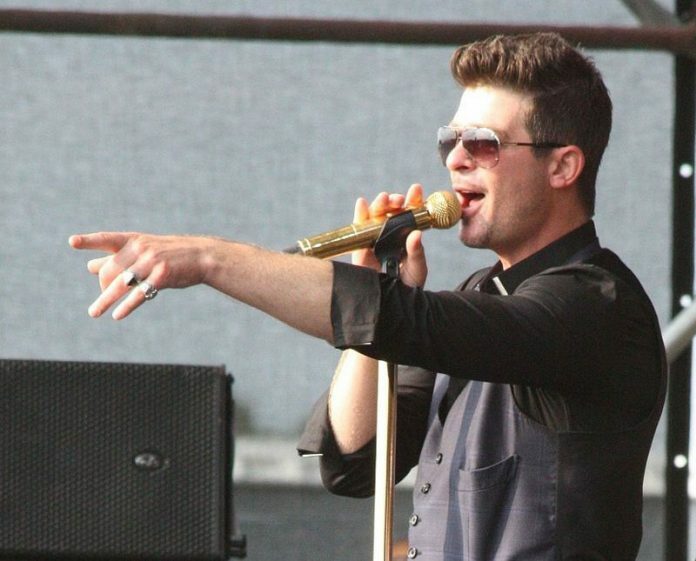 From riverwind.com: Robin Thicke has established himself as one of the most respected singer-songwriters in soul and R&B music today. Born in Los Angeles, Robin Thicke taught himself to play piano at the age of 12 and by 16 was writing and producing songs for top R&B artists. At the age of 21, he had written and produced songs on over 20 gold and platinum albums including Michael Jackson, Marc Anthony, Pink, Christina Aguilera, Usher, Jennifer Hudson and others. One year later he signed with Jimmy Iovine and Interscope records. The musician and composer released his critically acclaimed debut album, A Beautiful World, in 2003 under the name Thicke. The collection was followed by a succession of five critically acclaimed gold and platinum selling album releases. Robin’s sixth studio album, Blurred Lines, was released in July on 2013. The album garnered three GRAMMY nominations. The collection debuted at #1 on Billboard Top 200 while, “Blurred Lines,” the single, continued its 12 week reign on the Billboard Hot 100 chart making Robin the first artist to take the top spot on both lists since December 2012 and only the 17th act to earn the distinction in the past ten years. “Blurred Lines” scored the highest audience ever recorded and broke records by climbing to #1 on 5 radio charts simultaneously (Top 40, Rhythm, Urban, Hot AC & Urban AC) – the first time this has ever been done by an artist. Robin’s current singles are the undeniably danceable pop record “Back Together” featuring Nicki Minaj and an R&B classic “Morning Sun”. For tickets and more information visit riverwind.com.